Welcome to the Spanish Arabian Horse Society! 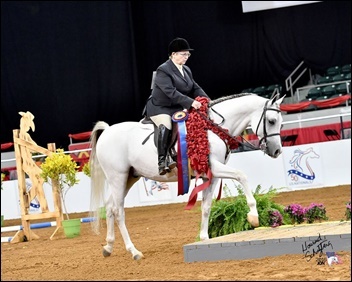 Spanish breeding made an impact at US Nationals in 2017. Top Ten in English Trail Open, Western Trail AAOTR, and Western Trail Open. US Sport Horse Nationals in 2016. Read the article published in Arabian Horse Life, Issue 1, 2017, here. Nominations are currently being accepted! Nominated horses must be owned by an SAHS member and can be either Classical Spanish or Spanish-Related (see definitions below). Nomination deadline is March 15, 2018. Send nominations to rustycook4412@msn.com. a results reporting form can be found here. Go here for membership information and applications. See past Champion and Reserve Champion Horse of the Year winners here. The mission of SAHS is to preserve, improve, and maintain the purity of Spanish blooded horses of the Arabian breed. SAHS strives for the advancement of education for the benefit of the public, to promote and facilitate the acquisition and distribution of the knowledge, in all countries, of the history, care and propagation of the Spanish Arabian horse. Many of the founding directors were members of a group of Spanish Arabian bloodline enthusiasts and breeders who first joined forces in the 1980’s. Due to changes in the Arabian market, and the passing of some of the leaders from that era, the group was “in hibernation” for several years. In 2004, the Spanish Arabian Horse Society (SAHS) grew from some of those previous members. SAHS received WAHO (World Arabian Horse Organization) affiliation on 22 October 2004 and AHA (Arabian Horse Association) affiliation on 16 November 2004. We are members of AECCA (Association Espanola De Criadores De Caballos Arabes) in Spain, and in August 2006 we merged with SAHBI (Spanish Arabian Horse Breeders International), giving us a true global focus for the promotion of the Spanish Arabian. Also in August 2006, AHA recognized the Spanish Arabian as one of the bloodlines on their Education Pages. On 18 November 2006 SAHS received the AHA Club Excellence Award for Communication, and was named the AHA Club of the Year! All Arabian enthusiasts with an interest in Spanish bloodlines are welcome to join us. This dynamic Club has made major strides in uniting Spanish Arabian breeders worldwide. Go to the Membership Info page for an application form. Paypal now accepted! Classical Spanish: A purebred Arabian horse that traces its lineage 100 % to importations registered in the Arabian Spanish Stud Book (SSB) prior to 1950.
de la raza árabe antes de 1950. Please feel free to contact any of the Officers or Directors. Your ideas and suggestions are welcome; your help is needed to make SAHS the best bloodline-focused group. Copyright © 2011. All rights reserved. No part of this text/site may be reproduced, translated into another language, or transmitted in any form or by any means, electronic, mechanical, photocopying, recording or otherwise, without prior written permission of the Spanish Arabian Horse Society.